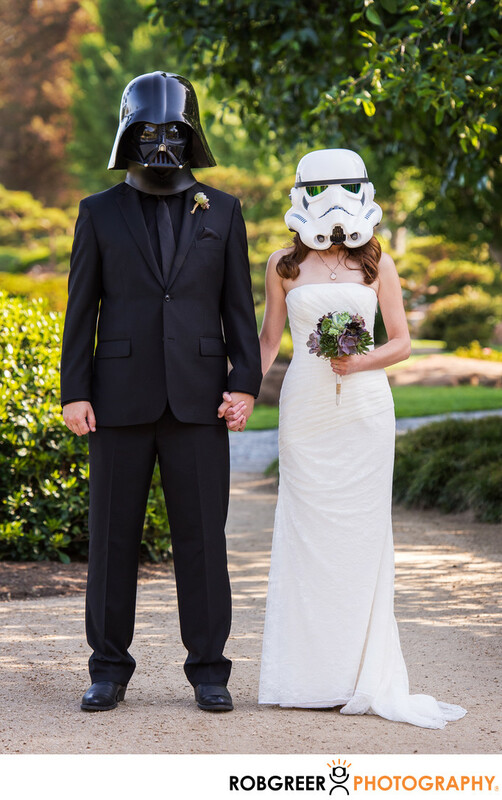 For this wedding at the Japanese Garden located in Van Nuys, the bride and groom begged me to bring along my Darth Vader and Stormtrooper helmets that I own because I am a geek. I did think it was a pretty neat idea, so I actually brought along an assistant that day just to carry a plastic bag containing the helmets so it have them readily available whenever I needed them. In the end, we used them for just a single photograph even though I had hoped to use them in more creative ways. If you're considering the Japanese Garden as a potential wedding venue, then you should know several things. First of all, it's an amazing location. It's a beautiful setting, the parking is plentiful, the grounds are impeccable, and the teahouse is a wonderful setting for a small wedding ceremony. And for Star Trek fans, one of the nearby buildings has been a stand-in for Starfleet Academy in several films. However, it is near a water treatment plant and when the wind changes, and unpleasant odor can damper festivities. Japanese Garden is located in Van Nuys, California. Phone: (818) 756-8166. Website: http://www.thejapanesegarden.com/. Contact Person: Betty Ethridge. Location: 6100 Woodley Ave, Van Nuys, CA 91406. 1/500; f/4.5; ISO 400; 135.0 mm.